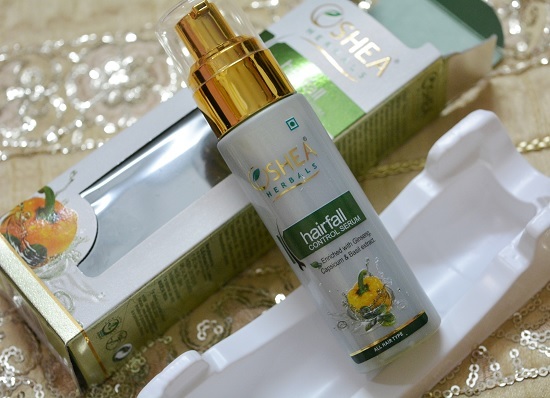 Hi everyone, I will be reviewing an anti hair fall range from Oshea Herbals today. Hair fall has become a common yet stressful problem. None of us would want to lose the glory of the hair. Once the hair starts falling out this sight alone can be quite irritating and stressful. In fact during monsoons hair fall aggravates, I have noticed this every year and I will not lose more that 4-5 strands when I wash my hair my with monsoon the no of strands can go up to like 30-40 strands. It says that it is pretty normal but I get worried. I got this range around a month ago and now that I am ready to review the products in this range. The hair fall defense range includes Oshea PhytoGAIN Hair Vitalizer, Amlacare Hair Fall Control Shampoo and Hair Fall Control Serum. Let me talk about these products individually. The hair vitalizer smells herbal in nature since this is enriched with the Tulsi, Bhringraj, Manjistha, Amla, Harad, Nagkeasar, Ashwagandha, Bahera, Rosemary oil like rare and essential herbs. This doesn’t feel oily or greasy but watery in nature. I will use this on the scalp and this gets absorbed very nicely. I do not feel heavy or greasy on my scalp when I use this hair vitalizer. This is why I can use this everyday without having to wash my hair every day. I think this has reduced the hair fall up to some extent as the no of strands that I use to lose have reduced so, I do not know if that is just because of this or the cumulative efforts of all the other products from this range. But the product is good. This is priced at 395 rupees. The hair fall control shampoo is enriched with amla and is greenish in color. I feel that the shampoo has made the hair thicker after the usage but also the shampoo has made my hair a bit dry. I mean for most of the shampoo, my hair behaves nicely but with this shampoo my hair gets a little dry after the wash, hence I had to go for conditioners. This shampoo is for 190 rupees. It is okay but not as per my liking. This serum is enhanced with Ginseng, Capsicum and Basil extract as the major component. Also it has Citric Acid-Astringent, Ginseng ext-Promotes new cell regeneration, Basil ext-Anti fungal, Ashwagandha extracts that promotes new cells growth. 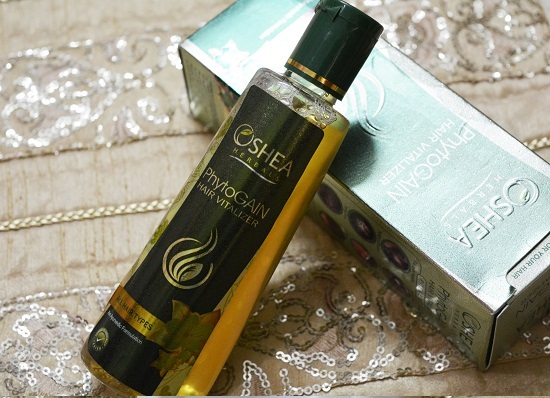 Oshea hairfall Control Serum stimulates hair growth while combating the hair fall completely. I feel that my hair strands are tad thicker. With this I mean the hair feels thicker in volume as this makes the strands of hair get thicker. In fact, they also feel bouncier. To use this serum, take 4-5 drops of Hair Fall Control Serum on the palm of the hand and apply on the hair roots, massage gently in to the scalp for 30 seconds. Leave and let hair dry normally. Use twice daily for better results. The texture of the serum is nice and get penetrated in the scalp quickly. This serum is for 390 rupees. 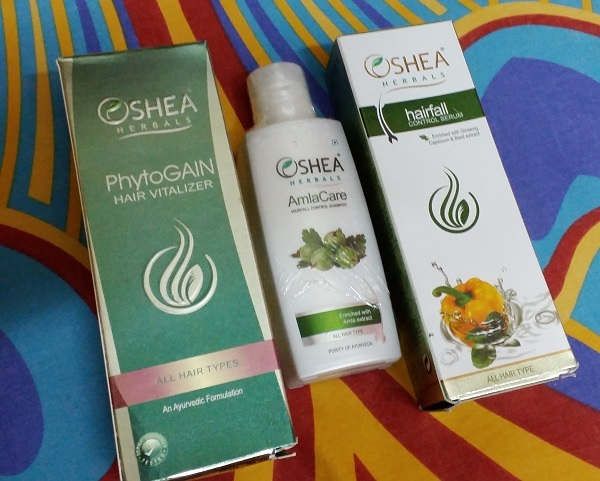 The hair fall control range from Oshea Herbals is decent range though I like the serum more and the vitalizer too. I won’t say this has given miraculous results but decent results and my hair feels thicker than before. This sounds like a nice brand to try out once.